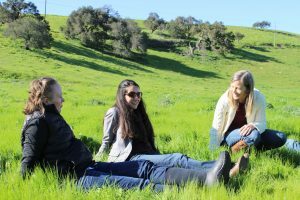 Sigrid Wright is passionate about Santa Barbara County and our environment. Raised in Oregon during a tumultuous time where debates raged about protecting forests vs. saving logging jobs, Ms. Wright knows that climate and the environment is a complex issue that requires bold action and strong leadership. With 25 years of professional environmental change experience under her belt, she understands that the road of progress is often littered with bumps and obstacles that can seem impassable. Recently, she took some time to chat with the Santa Barbara Foundation’s Jordan Killebrew about some of those road blocks and what she sees as a way through them. Jordan Killebrew: What are you passionate about? Sigrid Wright: I have on my desk at home a rock from the Arctic region that is somewhere between 300 and 600 million years old – by far the oldest thing that I’ve ever come in contact with. Actually it’s not rock, but a piece of fossilized coral that comes from a time when the ocean covered more of the planet, and the continents were blobs that wouldn’t be recognizable today. Holding this rock always brings me that sense of awe that we often don’t get in our over-connected, Twittery world. It reminds me of what an incredible blue marble we live on– one that took millions of years to become perfectly calibrated for human life. I’m passionate about that. I’m passionate about walking our sage-line mountain paths and stunning beaches, and fully appreciating that “the environment” is not some movie we watch from a distance, but a perfect and awe-inspiring mixture of conditions that we must steward. Jordan: What do you want people to know about our Santa Barbara County environmental issues and how they can help? Sigrid: I think most of us get how incredibly lucky we are to live here. I’m not sure you could design a more perfect and beautiful place. Anyone who has done much traveling knows that all around the world, many people lack access to things that should be basic human rights – clean water, healthy food, breathable air. But we need to be aware that even our in region with its appearance of abundance, not everyone has equal access to these basic rights. For example, our county is in the top 14 most productive agricultural counties in state (out of 58) – but in the bottom 12 in terms of providing consistent access to affordable, healthy food to all of its residents. These and other injustices will likely expand as the income gap widens and other pressures increase. In terms of how to help, I’d say that people tend to protect what they love. So find that and start there. Jordan: What are the most pressing environmental issue’s Santa Barbara County is facing? Sigrid: We have some critical decisions ahead about how and where to grow, and how to best use or protect the resources in our county. The jobs/housing imbalance is putting incredible pressure on our rich agricultural lands. Water is a serious concern in every water district in our county. And we’re at a pivotal point in terms of community values over the energy system. Will we capitulate to the federal government’s desire to re-open offshore oil drilling? Will we approve the 750 proposed on-shore oil wells in our county? Or will we really lean into the fact that our region – where the sun almost always shines and the coastal wind almost always blows and waves generate energy as they go up and down – could be a global model for renewable energy? Jordan: How can our community better address the needs of our environment? Sigrid: I came of age in Oregon at a time when a decades-long battle erupted between the logging industry and environmentalists working to protect some of the last stands of thousand-year-old old growth forests. There was a popular bumper sticker at the time that said “Save a Logger. Eat a Spotted Owl.” It became clear to me that framing big discussions as either/or – i.e jobs vs. the environment – might make for clever sound bites, but it’s absolutely unproductive. That polarization in our civic dialogue has gotten worse over the past few decades, and re-teaching ourselves how to engage respectfully with others is a fundamental first step. Jordan: What was one of the most rewarding moments in your career that made you feel like you were really doing good? Sigrid: Over a decade ago, the Community Environmental Council mapped out how our region could move away from fossil fuels in one generation, by 2030. This was one of the first regional energy “blueprints” in the U.S., written before states and cities began to even imagine such an audacious idea. Since then we’ve been working tirelessly to implement the plan, while global dynamics have shifted constantly. We saw a citizen’s movement emerge around climate change. We saw a massive economic recession delay good projects, including the first proposed wind farm in our county (which is now back on track). We saw California establish itself as a global leader on renewable energy. We saw the Trump administration say it will pull out of the Paris Climate Accord. With all of these ups and downs, there were two exceptionally rewarding moments. One was mid-2016, when the tri-counties region hit the milestone of installing 1 gigawatt of solar energy, on rooftops and through solar farms. The other was in 2017, when the cities of Santa Barbara and Goleta committed to setting goals of 100% renewable energy by 2030. Jordan: What is your organization doing to address the needs of our environment? Sigrid: All of these basic needs – food, water, housing, energy – are not only under the pressures of growing population and resource use, but are also affected by climate change. For our region, that’s showing up as increasing drought, year-round fire seasons, periodic microbursts and rainbombs, and subsequent flash floods and mudslides. Yes, we’ve experienced these things before, but not at this speed and magnitude. In the last generation we’ve seen a 330% increase in climate-related disasters worldwide. For a region whose top industries include agriculture and tourism, we can’t take something as simple as a stable climate for granted. As the tragedies and disasters of the last year have shown, everyone in our region is affected when the largest wildfire in California history tears through, or when a mountain has no vegetation to hold onto and decimates a community in a matter of minutes. These events have long tails, closing schools and shutting down highways and affecting small business and families for months. Wrapping our heads around what it means to be a “climate resilient” community is going to be our biggest challenge over the next few years. This is a space that CEC has been working in for awhile, and where having nearly 50 years of experience with community building is a huge asset. For example, we’re actively engaged in over 60 partnerships this year with other nonprofits, government agencies and schools. Those types of relationships are at the core of what it takes to be a resilient community. Jordan: How do you think the Santa Barbara Foundation can better address the needs of our environment? Sigrid: You asked, so I’ll give you a straight answer: divest your $170 million investment portfolio from fossil fuels. It’s impossible for our society to truly tackle climate change without putting our money where our mouth is. The UC system is there, the City of Santa Barbara is there, the State of California’s massive pension program CalPERS is getting there. Public pressure will soon demand that all of our major institutions stop backing an energy model from the last century. The Foundation can show its leadership by making this move now. Jordan: What gives you hope? Sigrid: Last month I had the honor of gathering in Mexico City with women mayors and environmental leaders from around the world. As the first woman CEO of a 48-year nonprofit , I’ve been really heartened to see how women all around the world are giving voice to so many critical issues. I would argue that women have a particularly big role to play in determining what happens next in terms of the health of our planet and the humans who live here. We’re also seeing a burst of energy from youth that gives me hope. You know, women instinctively pull together when under threat: rather than “fight or flight,” we lean toward “tend and befriend.” And given that globally, environmental threats impact women and children at greater levels, it’s essential that they have an opportunity to engage and help make better long-term choices on behalf of their communities. One of my environmental activist heroes, Naomi Klein, has a quote that speaks to the feeling that I have at this moment in time: History has knocked on your door. Did you answer?